Wavelength selectors limit the radiation absorbed by a sample to a certain wavelength or a narrow band of wavelengths. Sensitivity of an AAS is improved when the bandwidths are narrow and detectability is improved when transmission is high. 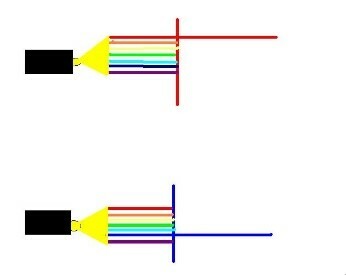 There are several types of wavelength selectors. Here we will consider filters, grating monochromators, and prism monochromators. Filters are wavelength selectors that allow narrow bandwidths of radiation to pass through. They can be divided into four main categories: absorption filters, cut-off filters, interference filters, and interference wedges. Absorption filters absorb most polychromatic radiation and transmit only a specific band of wavelengths. They are inexpensive and can be as simple as colored glasses or plastics. Only about 10-20% of the incident radiation is transmitted through an absorption filter. With cut-off filters, the transmission of radiation is nearly 100%. However, this is only achieved for a specific band of wavelengths and transmission rapidly decreases to zero over the remainder of the spectrum. 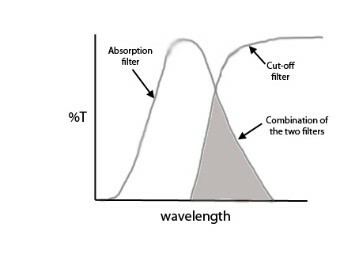 Usually, cut-off filters are not used as wavelength selectors but are used in combination with absorption filters to decrease the bandwidth of the absorption filter. Only the common wavelengths of the two filters will be transmitted which will achieve a much narrower bandwidth than absorption filters alone. An absorption filter and a cut-off filter used in combination will only transmit their common wavelengths. Interference filters are sometimes called Fabry-Perot filters and are dependent upon the concept of wave interference. 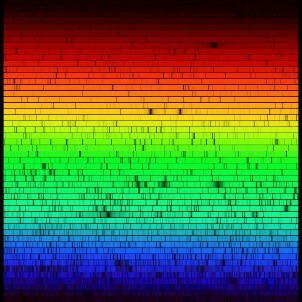 These filters will reflect some wavelengths of radiation while transmitting others. An interference filter is composed of a transparent dielectric sandwiched between two semitransparent metallic films and then two glass plates to protect the filter. 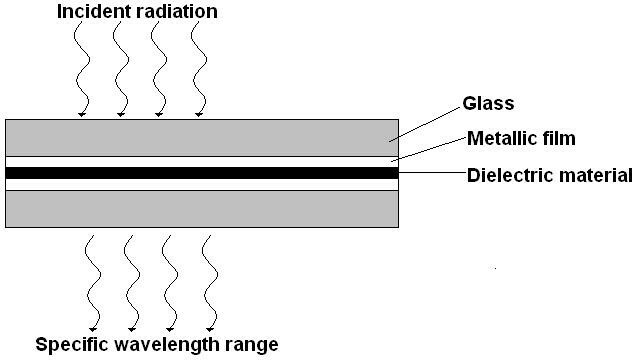 The thickness of the dielectric and the reflectivity of the metallic films are carefully selected because these factors control the transmitted wavelengths. The transmitted radiation will have a very narrow bandwidth. 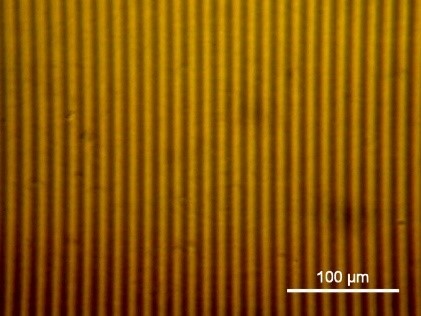 A wedge dielectric of different thicknesses can transmit a wide range of wavelengths without having to change the interference filters in an instrument. By choosing the correct position on the wedge, variable bandwidths of ~20 nm can be isolated. Grating monochromators are located within compartments of some AAS instruments and are responsible for producing narrow bands of radiation. There are five components found in most grating monochromators: an entrance slit, a collimating lens or mirror, a reflection grating, a focusing element, and an exit slit. When considering a grating monochromator, think of the entrance slit as a polychromatic radiation source. 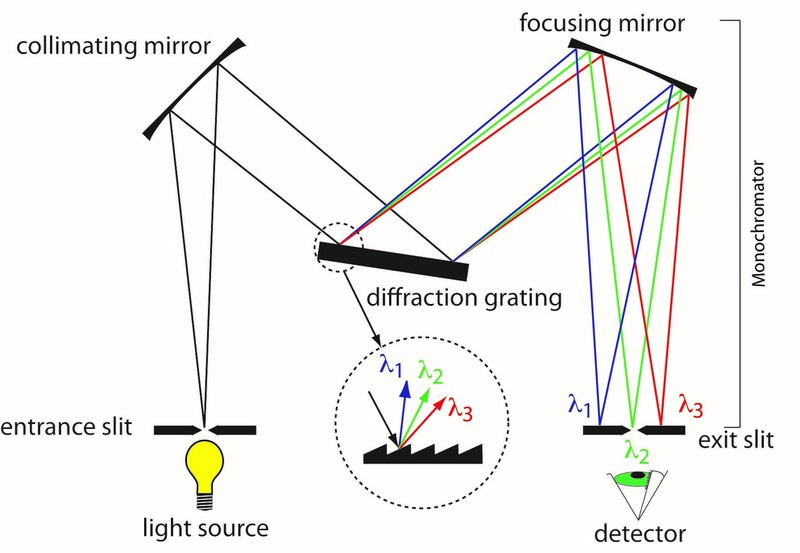 A collimating mirror reflects a parallel beam of polychromatic radiation toward a grating. The grating will reflect and disperse component wavelengths to a mirror that will focus a narrow band of wavelengths on an exit slit. Different wavelengths can be brought into focus at the exit slit by rotating the grating appropriately. The slits of a monochromator are an important consideration when determining the performance of a particular instrument. In a standard monochromator design, the entrance and exit slits have equal width. The slit widths should be kept as narrow as possible while allowing enough radiant power to reach the detector. If the slits are too wide, multiple wavelengths will pass through and cause poor resolution. If the slits are too narrow, the radiant power that can reach the detector will be decreased and difficult to detect. Therefore, the slit width is a compromise between resolution and detectability. Although the width of the slit should be carefully adjusted, some instruments have a fixed slit width optimized for general purpose applications. Gratings reflect and disperse collimated ultraviolet, visible, and infrared radiation. Dispersion is the ability of a monochromator to separate different wavelengths of collimated, polychromatic radiation. The change in the angle of reflection varies with wavelength. In other words, polychromatic radiation will be separated into its components because each wavelength of radiation will be reflected by the grating at a different angle. 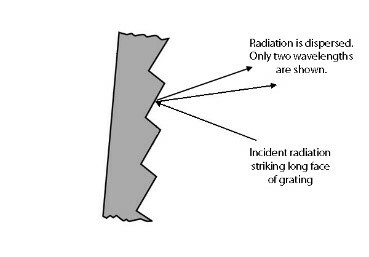 One of the major advantages of gratings is the uniform way they disperse radiation linearly along the focal plane. 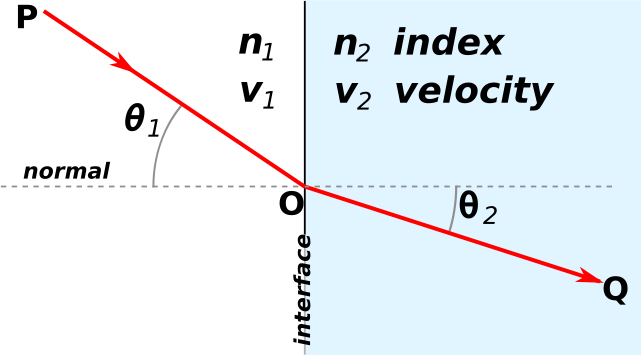 The figures below illustrate the linear dispersion in a grating system. 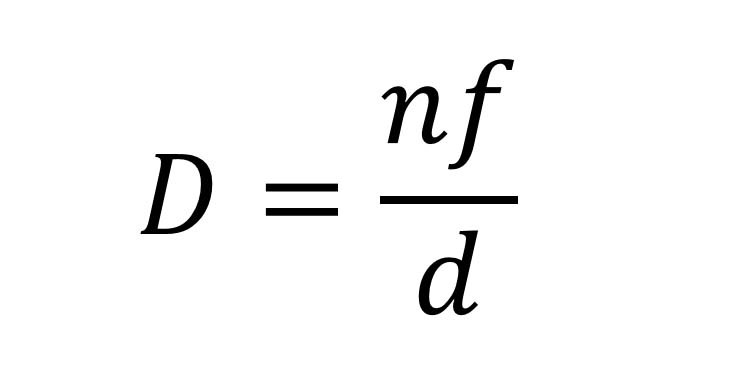 Although linear dispersion can be calculated using the following equation, we will not discuss its derivation or the variables here. Just note that increased dispersion means better resolution, and that dispersion increases as the distance between grooves decreases or the focal length increases. A reflection grating consists of a hard, polished, optically flat surface containing many parallel and closely spaced grooves that is covered with metal to increase reflectivity. The groove density can be a low as 10 to as high as 6000 grooves/mm. Typically, a grating for the ultraviolet and visible region has approximately 300 to 2,000 grooves/mm while a grating for the infrared region has approximately 10 to 200 grooves/mm. Two types of reflection gratings are usually encountered in spectroscopic instruments: eschellete and echelle gratings. Variations in their design and manufacture are available. For instance, concave gratings exclude the need for collimating mirrors and lenses reducing instrument complexity and cost. Holographic versions reduce the cost of manufacturing while increasing resolution by enabling the production of large gratings with increased line density. Echelette gratings are the most common type of grating used in spectroscopic instruments. They may contain 300-2000 grooves/mm, but an average groove density of about 1200-1400 grooves/mm is most common. This type of grating uses the long face of the groove for the linear dispersion of radiation. 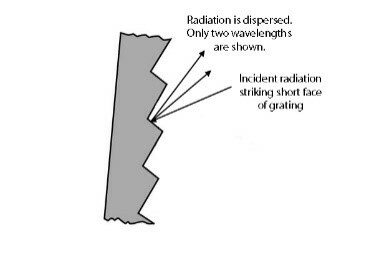 Echelle gratings use the short face of the grooves for the dispersion of radiation. Although echelle gratings may contain only 80-300 grooves/mm, echelle gratings are known for their very high dispersion. Their dispersion is so high, however, that cross-dispersion must be used. Cross-dispersion is achieved by placing the axis of another dispersing element 90° to the echelle grating. The combination of an echelle grating and a prism (or another grating) is called an echelle monochromator. The result is a two-dimensional spectrum of short vertical lines lying along 50-100 horizontal axes. This combination of elements provides much greater resolution and light-gathering power than echelete monochromators. Prisms refract light at the surface of two interfaces creating angular dispersion, and can be used to disperse ultraviolet, visible, and infrared radiation. The light beams are refracted when they enter the prism and leave. This all happens according to Snell’s Law of refraction, which states that n1sin θ1 = n2sin θ2. 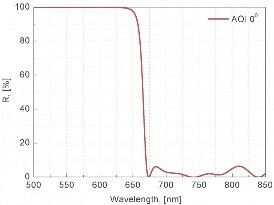 An advantage of using prisms is their wide spectrums that can be obtained despite their low dispersion. However, prisms use a non-linear dispersion method. This makes it difficult for focusing a desired wavelength through the exit slit. The wavelength and dispersion have an inverse relationship, where shorter wavelengths cause increased dispersion. 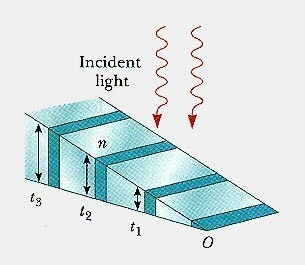 The figure below displays the nonlinear dispersion of a prism.